Thar be sea monsters about! I hope the third panel makes sense. Holy cow, that reflection is AWESOME! 😀 Great work, Scott! Objects in mirror are closer than they appear. Well, that what my door mirrors say. Very much so. The expression, that capture of shock is fantastic! It makes perfect sense. She sees the reflection of herself and the giant fish in Alex’s armor (made easier due to her arrow, which shines bright enough to reveal the fish, and not just the glowing lure that most of its prey would see). It’s a good thing that Alexander got his armor polished recently..
LOL I was just thinking the same thing! Brilliant, that Scott decided to make the fact that his computer is now strong enough to handle armour reflection (or whatever the reason was he added it back in the Centaur village) actually turn into a plot device. Well done! Seriously, though, that armor must have some spells on it to make it more reflective or something. What? Stuck at a wall with no means to progress and no idea where to go from here? This sounds like a job for… Guardian Monster! The ultimate way to advance the plot by fighting or running from enormous beasts who coincidentally force you onto the path leading to the object of your quest. Guardian Monster is not for everyone and may cause armor damage, injury, distressed damsel syndrome, minor character death, and/or temporary loss of major character(s). lol Now where can I get my own Guardian Monster Random Bird? Just call 1-800-OHBUGGER for your free trial. Oh, that reply just cracked me up – and made my evening a lot nicer! Well played! Hey thanks! Just what I needed to get my day started! So, the fish appearing like that means that there is a race of huge carnivorous fish that made the lion statue? I think I saw a fish like that once. Twas on Grim Fandago I think…. Maybe I am wrong. All those deep sea monsters look alike. This is a real dark place with monster fishes, its like a nightmare… Have they swim all the way to the nightmare relm? And where can the lady of the lake be… I tink she might be trapt some where here in all those yers, by som evil creature… a dragon! Something’s coming. Meesa gonna die. LOL Now Isa have ta watch Star Wars again. To perfect! Just make sure you’ve got the real stuff for Ep. IV-VI. I cast the “Summon Bigger Fish” spell! Nice to see all that work you did giving Alex shiny armor is paying off! Scott, that is excellent use of the software. I know you have been talking (err, typing) lately about that not only do you need to think of what’s in FRONT of the camera, but also what’s BEHIND it, due to the reflections. Now, this is perfect – great thinking! I hope we get to see more of these little hints… perhaps someone giggling behind the back of others, or something like that. Ok, so who was the brainbox who cast Summon Bigger Fish! Okay, I admit it: I didn’t read your comment before posting mine above. You get credit for the Obscure Reference. Glad it worked storywise. I thought it would be fun. I had to up Alexander’s armor’s reflectivity to 100% for that shot. Normally it’s at 50%. Essentially…it went CHROME for that panel. You don’t mean… They have Google, in Dreamland??? Yeah, and how do the merpeople procreate? Do the female of the species lay eggs and have the male ‘swim’ over them? Answers, please! M…. maybe it just wants a hug? Oh look, another sign of life! That reflection is brilliant, Scott! And an angler fish for a giant monster is a great choice! Yeah, now I wish I had posted my prediction of an Angler Fish Monster on an earlier page so I could have looked smart. Hmm… that third panel just doesn’t fit well. The lighting is all wrong. But the reflections don’t really work in low light, so the mismatched lighting is plot relevant. Actually, Staj is looking slightly in front of Alex looking in front of him and is holding a glowing arrow in her hand looking into his breat plate. Therefore there is MORE light present in the vicinity of his chest, see panel 1 for reference. It feels different because the other panels are from a distance and are darker. You forgot to correct BREAST plate. Unless it was a beast plate or beat plate or blest plate or we could go with armor (or is it armour, definitely not armoire). Yes, but there’s still much less light in the vicinity of the fish, they’re so deep underwater that it’s too dark for a reflection to look so clear. Just take my word on this okay, I’m going to university to learn how to do this stuff, I know how the rendering process works. It’s plot relevant, so I can see why they did what they did, but it’s still incorrect lighting. I’m basically saying it’s a necessary evil. Giant Fish: Pardon me, would you happen to have some grey poupon? I love the third panel. The panic is doubled because it implies that Alex is the first on the list to be turned into fish food and Nastajia can’t have that. A Sicilian never loses a game of wits ahahahahaha…… flop. I was so into the first panel that when I saw the second panel it did quite literally freak me out! Nice job with the scariness aspect! *cue jaws theme music* really, who didn’t see this coming? the mermaid king didn’t want them to go there for a reason. I am trying to figure out the background of the 4th panel. Namely, what’s the big green thing? Is that an odd-colored fish fin or something? 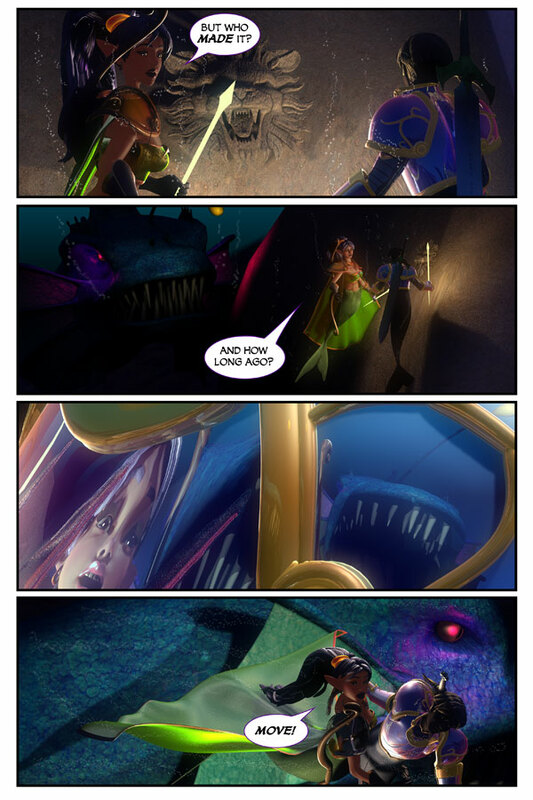 The Large green things in that panel include: The side-fin of the giant fish (which seems to have changed from purple to green, probably because of the different lighting) , Nastajia’s cape, and Nastajia’s lower body. Alex got mistaken for shellfish! … what? It’s a valid notion! I wish that my armor was shiny enough to get that good a reflection.